We’d love your help. Let us know what’s wrong with this preview of Spin the Golden Light Bulb by Jackie Yeager. To ask other readers questions about Spin the Golden Light Bulb, please sign up. I like how inspirational this novel is; it promotes that we should always strive to achieve our goals and dream. Being creative, inquisitive, not following the norm, being cooperative, and dauntless are just some of the lessons that kids will learn on this novel. If you are looking for a present to your child who is in middle grade or if you want him to read more – this book is a highly recommend. Be Curious. Be Creative. Be Collaborative. Be Colourful. Be Courageous. Spin the Golden Light Bulb is Jackie Yeager’s debut novel. I’ve been having lots of luck finding brilliant debut novels recently and this middle grade novel is no exception. Jackie Yeager takes us on a journey to 2071, where people travel by aero-car and kids are referred to at school by their number, not name. Kia Krumpet’s number is 718, she has an ex-best friend and no one at her school, Crimson Elementary School, has e Be Curious. Be Creative. Be Collaborative. Be Colourful. Be Courageous. Kia Krumpet’s number is 718, she has an ex-best friend and no one at her school, Crimson Elementary School, has ever won a Golden Light Bulb in the Piedmont Challenge. If Kia doesn’t secure one of the coveted Piedmont Challenge positions, she won’t be able to enrol in her dream school, Piedmont Inventors Prep School (PIPS). Instead, she’ll face programming like everyone else, and she can’t imagine anything worse. Programming determines which one of six academic categories sixth graders will study for the next six years - Art Forms, Communication, Earth and Space, Human History, New Technology, and Math. Kia has dreamed of attending PIPS since discovering her Grandma Kitty won the first Piedmont Challenge. Kia has a list of 67 inventions she wants to create but unless she is successful in gaining entry to PIPS she’ll never have the chance. * Being smart is a good thing! * Being good at more than one academic area is a great thing! * While academics is really important, so is character and creativity! * The illustrations. Gabrielle Esposito has really captured the essence of the book in her illustrations. They’re fun, imaginative and correspond well with what’s happening in the chapters. My only real grumble with this book is that the separation of tasks whilst making the set piece and costumes was so clichéd. The girls made the costumes and the boys made the set piece. I had some hope when Mare knew about the best types of wood to use because of her experience with her father’s constructions work, but when it came time to build and work on the mechanics of their project it was a job for the boys. I came away from reading this book wanting to strive to achieve my goals (and to believe in myself while I’m working towards them), to be a better friend, to have more fun and to add Jackie Yeager to my ‘read this author’s next book regardless of the blurb’ list. The way this book ends leaves plenty of room for a sequel, which I’d be very interested in getting my hands on. Invention competitions, teamwork and lots of good feeling - a great book for kids! I love books that promote great behaviour, without coming across as 'lecturey'. I also love books with plenty of imagination and inventiveness. Fortunately for me, Spin the Golden Light Bulb had both of these qualities in abundance! Kia is a top student at her school in New York - in the future. She's desperate to win a Golden Light Bul I received a copy of this book from Netgalley, in exchange for an honest review. Kia is a top student at her school in New York - in the future. She's desperate to win a Golden Light Bulb, and earn her place at Piedmont Academy, where she'll compete with her fellow team-members to come up with a winning invention. After a sterling performance, she wins her place, and ends up on a team with Ander (a bit of a goofball), Jax (the serious one), Mare (who is a little bit mardy) and Jillian. Together, they work to come up with a winning project, whilst enjoying all the wonders of the academy; from sparkling air filters in their bedrooms, to Nacho Cheese Ball games. I loved the book's inventiveness - it's got some great concepts, without being too over-the-top or unbelievable. I also loved the central messages; that teamwork, listening to one another, and being understanding and adaptable can win the day. These are all great messages for kids to hear, and this book slips them in perfectly, without coming across as preachy. This is middle grade novel that deals with creativity and accomplishing goals. I won't be describing the book because I don't want to spoil it but it was fun, different, very interesting. I did had the problem that I found it a bit slow, thing didn't happen that quickly. Probably for the audience the book is intended would work. But overall I found it enjoyable. Kia Krumpet, aka #718, has a dream, and she knows how to fulfill it. She wants to invent the world's first underwater bubble bike or muffin baking pants or one of the other sixty-seven innovative things she has running around in her head. Kia thinks that her path to success lies in getting accepted into the Piedmont Inventors Prep School. Otherwise, she'll be programmed against her will into an area chosen for her and not by her, like all the other eleven year old students in America in 2071. The Kia Krumpet, aka #718, has a dream, and she knows how to fulfill it. She wants to invent the world's first underwater bubble bike or muffin baking pants or one of the other sixty-seven innovative things she has running around in her head. Kia thinks that her path to success lies in getting accepted into the Piedmont Inventors Prep School. Otherwise, she'll be programmed against her will into an area chosen for her and not by her, like all the other eleven year old students in America in 2071. The only way into PIPS is to win the Golden Light Bulb trophy at the Piedmont Challenge. From the very first local challenge all the way to the national finals, we bite our nails along with Kia as she and her teammates, the Crimson Five, face challenges, disagreements, betrayals, and setbacks in an attempt to work together to solve a complicated problem and to present their solution to the judges. This reader was so invested in Kia's journey that I had to really fight the impulse to read ahead to find out if Kia's team won. Spin the Golden Light Bulb successfully combines enchanting magical surroundings such as aerocars, sparkling bedchambers, floating games, and robotic monkeys with traditional values such as cooperation, friendship, honesty, and hard work. I loved this book! It is perfect for children in middle school. There are many creative ideas throughout the book that create a dazzling image in your mind of the setting. The first-person point of view lets you into the mind of that character as well as what she thinks of the others. A great book inside and out! I love NetGalley for giving me such gems from time to time. Spin the Golden Light Bulb is a debut novel of Jackie Yeager and what an exceptional middle-grade novel it is! I was involved in the story from the first page itself..
From the blurb, you can get that the story is set in the year 2071. This is the year when people travel by aero-car and the students are not called by their name but the number at their school. This is a story about Kia Krumpet, number 718, and her journey for chasing her dream to enter in Piedmont Inventors Prep School (PIPS) – her dream school. She studies in Crimson Elementary school where no one has ever won the Piedmont challenge. But Kia wants to win that because her grandmother Kitty was the first-ever person to win that challenge. Her grandmother was her role model from her childhood and Kia wanted to be everything like her. Kia manages to secure a place in the team to compete in the Piedmont challenge. At first, she had travel connecting with her group members but slowly they form a good friendship and move forward towards achieving their common goal. Kia’s team is called The Crimson Five (hence the series name) because her team was the only one to have all the members from the same school. Each of them has different traits. Jax is the calm one with always a computer with him trying to research about making apps. Marianna(Mare) and Jillian are the talented girls but Marianna is the one with almost foul mood. Ander is the naughty one and later becomes Kia’s best friend. I liked how Jackie Yeager has curated the team of children, each with different hobby and passions. Though the common goal of each of them is same, they want to achieve it differently. There were many good things for middle-grade students to learn from this book. Jackie Yeager has thrown many useful information here and there. There is a sentence when Kia is talking about pi and then she is talking about how petroleum should be saved. I think, mentioning such things were really innovative. Kia has been shown as a determined and strong girl which gives inspiration to children to be more like her and try to achieve their dreams. Children need to know that being smart and intelligent is actually a necessity in today’s world. While most of the parents force their children to be good in academics, being creative is also important. Jackie Yeager has also told the value of friendship and teamwork through her characters. If you have good friends you can achieve any thing you thrive for and if you have a good team, no matter how bad the condition is, you will make something out of it. These are the real important traits that children these days should definitely learn. At certain moment, Kia is loosing her confidence in herself. This tells you that it is okay to have these kind of moments too. But you have to fight back and have to emerge as even stronger. I loved the imagination that Jackie Yeager has put into the whole story. And the cherry on top is that the imagination is in fair amount. You won’t feel as if it has been over done. There were magical things like aerocars, robotic monkey, sparkling rooms to eliminate negativity, floating gameboard, hidden cameras and many more. None of these felt over the top and perfectly fit the story. I would really like to applaud the author for all this creativity and to thrive children to actually think about such amazing things. In the beginning of each chapter there are different illustrations. I really liked those illustrations. Though not all the illustrations were unique, but they beautifully captures the essence of each chapter in the book. I am nearly 30, still I loved this middle-grade book so much. In my opinion, this is a must read for all the middle-grade children. I was amazed by the book’s inventiveness and that too in the right amount. I loved the central message that the author is trying to portray- With friendship and teamwork, you can win any day. At first, I was not ware that this is actually going to be a series. Now that I know, I can’t wait to read the sequel and to follow the Crimson Five on their next adventures. I received this book as a prize for getting a Trivia question right during Kim Chance's debut launch party on Youtube. The question was: When was the lightbulb invented? The answer: 1879. I'm very greatful to Kim Chance for this prize and for Jackie Yeager for providing her book as a prize! It came with two bookmarks, stickers, and an autograph with the words "Think more, Work hard, Dream big!" Since I'm giving out thanks, I'd also like to thank the freezing rain storm which gave me a day off fr I received this book as a prize for getting a Trivia question right during Kim Chance's debut launch party on Youtube. The question was: When was the lightbulb invented? The answer: 1879. I'm very greatful to Kim Chance for this prize and for Jackie Yeager for providing her book as a prize! It came with two bookmarks, stickers, and an autograph with the words "Think more, Work hard, Dream big!" Since I'm giving out thanks, I'd also like to thank the freezing rain storm which gave me a day off from work, otherwise I wouldn't have been able to finish the book today! This was another wonderful middle grade book that I'm so glad that I was able to read. It was a wonderful chance to get lost in a world where kids want to do well and are moved to figure out their best way to make things happen. The friendship that was embraced between these kids and the hard work that they had to portray was a story of determination, fun, and love. I think this is a great story and one that should be shared and read by many. Super fun story that will make kids want to be creative! This book was so good everyone, just so good. It's a middle grade book, but as a semi-adult of 25 years I couldn't stop turning the pages- I just wanted to find out what would happen next! The setting of 2071 was so interesting and just reading about this speculative future (as is any kind of discussion about the future as we just don't know!) through the eyes of an 11 year old girl that so desperately wants to be an inventor but has to win a team competition just to get the chance to fulfill he This book was so good everyone, just so good. It's a middle grade book, but as a semi-adult of 25 years I couldn't stop turning the pages- I just wanted to find out what would happen next! The setting of 2071 was so interesting and just reading about this speculative future (as is any kind of discussion about the future as we just don't know!) through the eyes of an 11 year old girl that so desperately wants to be an inventor but has to win a team competition just to get the chance to fulfill her dreams blew me away. The story is so empowering for young girls that want to get into STEM and I'm so grateful I had the chance to read it. Thank you to Amberjack Publishing and NetGalley for the opportunity to read and review what is sure to become a hyped book in 2018! Think America's Got Talent where the talent is brains and creativity. Put together a bunch of kids with assorted personalities but the same creative drive and you've got a super competition. Are the Crimson Five, a group of kids who just happen to be from the same school, up to the challenge in the national competition? Set fifty years in the future, the author is obviously one of those out of the box thinkers, when she describes the kids bedchamber filled with floating silver sparkles which jus Think America's Got Talent where the talent is brains and creativity. Put together a bunch of kids with assorted personalities but the same creative drive and you've got a super competition. Are the Crimson Five, a group of kids who just happen to be from the same school, up to the challenge in the national competition? Set fifty years in the future, the author is obviously one of those out of the box thinkers, when she describes the kids bedchamber filled with floating silver sparkles which just happen to be the invention that won the Piedmont Challenge the year before. They are air-purification sparkles - micro beads that purify the air! Spin the Golden Lightbulb is filled with challenges both social and academic for the Crimson Five. I felt like I was along for the ride through their ups and downs, and anxiously awaited the outcome while enjoying a glimpse into the future as imagined by the author. My 10 year old granddaughter is getting my copy to read next! This book! So inspirational, so cute, so real, so inventive, and so creative! Would have been my favorite if I had this as a kid. It's already one of my favorites as an adult. Thanks to the @kidlitexchange network for the Advanced Reader copy of this book to review. All opinions are my own. It is the year 2071, and sixth grader Kia Krumpet (student number 718) can’t wait for the chance to compete for the Golden Light Bulb award and earn a chance to attend Camp Piedmont. If she doesn’t make it to camp Piedmont and earn the chance to attend PIPS, she will be stuck getting programmed and will most likely have to study math. When Kia, and four other students from her scho Thanks to the @kidlitexchange network for the Advanced Reader copy of this book to review. All opinions are my own. It is the year 2071, and sixth grader Kia Krumpet (student number 718) can’t wait for the chance to compete for the Golden Light Bulb award and earn a chance to attend Camp Piedmont. If she doesn’t make it to camp Piedmont and earn the chance to attend PIPS, she will be stuck getting programmed and will most likely have to study math. When Kia, and four other students from her school, win Golden Light Bulbs and head to Camp Piedmont, the competition is on! “The Crimson Five” must work together to answer a question using elements from six academic categories. Only the students receiving receiving 150 points or more will earn the chance to move on to the National Championships and have the chance to attend PIPS. The team faces some obstacles in their quest for the finals, but they learn that if they can “be curious, be creative, be collaborative, be colorful, and be courageous” anything is possible! I love how Kia is so motivated to succeed. She learns many lessons in the story about herself, how to make friends, and how to persevere. This story sends such a positive message for middle grade students. I can’t wait to purchase Spin the Golden Light Bulb for my classroom and school library! 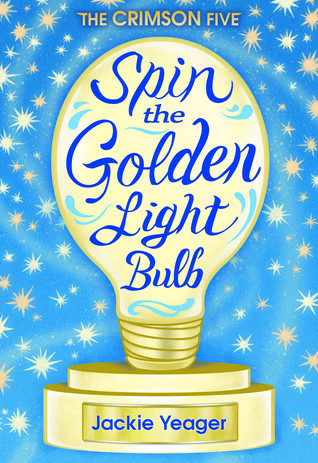 I greatly enjoyed reading Spin the Golden Light Bulb, a YA story by Jackie Yeager. This story about a team of sixth-grade students in a national creativity competition kept me very interested. As the team faced and overcame several obstacles, I felt for their struggles and rooted for their success. The dreams and struggles of the main character, Kia Krumpet, become important to the reader. The other team members, her family and competition advisors fill out the story with a diversity of individu I greatly enjoyed reading Spin the Golden Light Bulb, a YA story by Jackie Yeager. This story about a team of sixth-grade students in a national creativity competition kept me very interested. As the team faced and overcame several obstacles, I felt for their struggles and rooted for their success. The dreams and struggles of the main character, Kia Krumpet, become important to the reader. The other team members, her family and competition advisors fill out the story with a diversity of individuals that create a future world you can envision, and would find interesting if you could. There are surprises, twists and sparkly inventions that add flavor and detail to the story. If you have a YA Books You Want to Read List, I recommend you add Spin the Golden Light Bulb right at the top. I really enjoyed reading this book primarily because it deals with perseverance which I have found to be lacking in some students. The is in this book hit a series of problems and had to work together in order to solve them. I also really appreciated the story because it focuses on working as a group. I have observed that many people are content to work by themselves but have difficulty when they have to share ideas. I received a copy of this book from Netgalley, in exchange for an honest review. My first book, SPIN THE GOLDEN LIGHT BULB made it's grand entrance on January 9, 2018! I'm so excited to share it with you. The story was inspired in part by my experience as an Odyssey of the Mind coach and my team's trip to the World Finals. Think costumes, props, problem solving, inventions, and creative performances. It's a story of friendship, family drama, and working together to face challenges as you chase your dreams. But Kia, Ander, Mare, Jax, and Jillian's story is so mu Hey Everyone! I received this from Kidlit Exchange, and this review is totally my own. This is a fun book with themes of teamwork, perseverance, and forgiveness. Kia and her four teammates are competing for spots at a prestigious school for inventors. They are given a theme and a task to work on together. Along the way they must learn how to work with difficult team members, deadlines, and possible sabotage. Secrets are revealed that make Kia question her abilities and worthiness this task requires. I loved this book!! It was a treat to read it. I could identify with each character, and could picture them as if they were sitting in the room with me. I loved Kia and how driven she was. Anders made me laugh. Gregor made me mad. I was so impressed with the invention from this team and past champions. Very cool how they were all integrated into the story. This is a great read for kids and adults. I hope we see another book in a series!! I absolutely loved this book! So creative and fun and I can't wait to read the next one! One of my favorite aspects of Jackie Yeager's debut novel is that her characters inspire the mid-grade reader to reach for the stars, dream big, and use their educational and intellectual talents. Through her creatively told story, readers see that achievements do not necessarily come easy, but require hard work and determination. That alone is a valuable life-long tool. Well done! Fun and inspiring! The depiction of creative collaboration - not cutthroat competition- particularly resonated with me. Readers will be genuinely excited to learn there will be a sequel. These are characters they’ll enjoy spending more time with! I loved this book! I love the inspiration it creates and the message to always follow your dreams. The friendships in this story were heartwarming! This is a very positive book for young readers helping them understand that anything is possible and that you always need to do your best. I thought the book was a little simple at times but I will recommend this book to all young readers. Great book and amazing messages and lessons! This book deserves maybe one or two stars, if I had not read it all the way through. For the first 60% of the book I had to force myself to read this book with boring characters trying to win a contest to go to an elite school, where they would learn all the things, instead of just one of the main subjects. Because, ohhh, if they don't win, then they will be "programmed" into only one subject, and ohhh, the main character, KK, or whatever her name is, just can't stand to do, because then she can' This book deserves maybe one or two stars, if I had not read it all the way through. For the first 60% of the book I had to force myself to read this book with boring characters trying to win a contest to go to an elite school, where they would learn all the things, instead of just one of the main subjects. Because, ohhh, if they don't win, then they will be "programmed" into only one subject, and ohhh, the main character, KK, or whatever her name is, just can't stand to do, because then she can't invent her underwater bicycle, which she reminds us, oh, I don't know many times, but enough that we get the fricking idea. Yes, you are so so special, and you need not be programmed. You need to go to your special school. For the first sixty percent of the book, the group works on a stupid project to try to win the competition. And it is not just me saying it is stupid. One of the other protagonaists feels the same way. If the book had been the last forty percent of the book, it would have gotten four stars, and I would be eager to read the rest of the series. As it is, I will probably forget all about this book once I finish writing this review. As for world building, yuck. This is the near future, where all children have only numbers when they go to school, they have flying vehicles and if a child wants to go to a school that will let them be creative and have a special education they have to compete for it in sixth grade, and only a lucky few can make it. But there is no explanation, or anything else that is odd. There are still cell phones, that do what cell phones these days do. Oh, there are other futuristic stuff, but cell phones still take pictures, and you still make calls with them. If you can make it to the existing bit in the final third, I would say go for it, and perhaps the next book will explain some of these things, otherwise, give this book a pass.